Dog walking is part of the pleasure of being a dog owner, but life is busy! And we can’t pack everything in. So whether you’re busy working (away or at home), out for the evening, late home or pushed for time any reason, we can help. 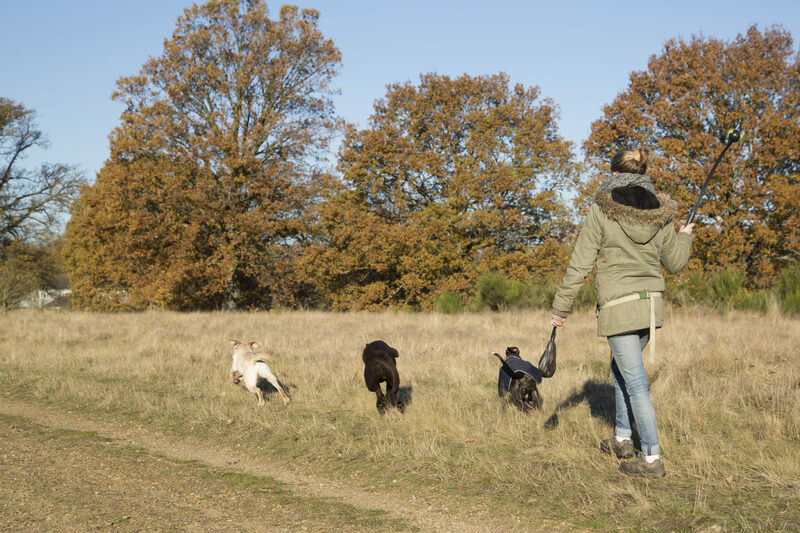 We provide lovely individual or group dog walks, daycare or overnight boarding for your dogs or puppies to give you the freedom and let you know your dog is having the exercise, fun, socialisation and care they need. Your dog will have a fantastic hour’s dog walk, though we can tailor this if your dog has specific needs. And all our walks are carried out in parks and green spaces, so it’s safe and interesting for your dog to walk on or off the lead, providing lots of exercise, fun and frolics. Then we just do it! Book or cancel online. Pay monthly by card or direct debit. Easy. And if your walker’s away Then your back up walker will be there instead! What stage is your dog at? Brilliant fun! Small groups of dogs in the great outdoors in fab spaces. Some energetic, some more sedate according to their needs. Easy online booking you can talk to us during the day, but you can book and cancel and pay online whenever you like. The internet never sleeps! Easy payment options you don’t have to worry about leaving out cash or writing cheques. You can pay monthly by direct debit or transfer or card. We make things easy peasy. Your dog will have a fantastic hour’s dog walk, though we can tailor this if your dog has specific needs. And all our walks are carried out in parks and green spaces, so it’s safe and interesting for your dog to walk on or off the lead, providing lots of exercise, fun and frolics. We vary the locations of the walks to provide variety for your dog and also look to avoid places where there are too many other dogs. Our local knowledge is excellent and shared amongst us and we adjust our walks accordingly. The safety of the dogs and our dog walkers is our number one priority so we are continually reviewing where we walk to ensure this. Also having been in operation since 2000, for security reasons we made a decision a few years ago to stop using branded vehicles. Some clients were concerned about vehicles providing an alert that they weren’t at home. As dog napping became a ‘thing’ we knew we’d made the right decision to avoid that form of marketing – we certainly didn’t want to advertise our routes or our precious cargo to anyone. So we stopped with the stickers. 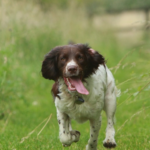 Your dog will return home safe, happy and tired having had great fun with his or her friends. Happy Hounds & Cooler Cats are experts at tailoring each walk to your dog’s individual needs and are more than happy to play with favourite toys or to reinforce any training or routines that you have in place. Because we are a team, we can also ensure your dog is with the right person and group for their individual needs. And if their needs change, what we offer can change too. We always check that water bowls are full, wet dogs are towelled down and we can also follow any feeding or medication requests you might have. What times are the walks? We provide day time walks while you’re at work, but evening and weekend walks are also available, if you’re out and about, working shifts or just haven’t got the time yourself. Get in touch for more information. Our walkers are fully insured, thoroughly referenced and police checked as well as being fully trained by us so you can be sure your dog is in great hands. We are all very experienced dog lovers and will ensure your dog has a great time. We can provide either one to one walks or group walks of a maximum of 6 so your dog can enjoy playing and having fun with other friendly dogs. And you can meet some of our lovely walkers here. For more information on any of this, please check out our Dog walking FAQs or get in touch and have a chat. Well, just contact us or call us on 020 3743 9247 / .7957 585 175. We’ll then take some information about your dog and then arrange to come and say hello at a time that suits you. We are very flexible and will always look to tailor our dog walking service to your dog’s individual needs. There is no obligation at all. We are also happy to arrange a complimentary trial dog walk with your dog walker to make sure that you and your dog are 100% happy before you start. Most of East London, North East London and parts of Essex including Leyton, Leytonstone, Forest Gate, Stratford, Walthamstow, Wanstead, Snaresbrook, Woodford, Woodford Green, Woodford Bridge, Buckhurst Hill, Loughton, Chingford, Leytonstone, Leyton, Forest Gate and Aldersbrook and surrounding areas. In Kent and South East London we cover Sevenoaks, Tunbridge Wells, Hildenborough, Pembury, Tonbridge and surrounding areas. If you don’t see your area, get in touch anyway: you never know. And if we can’t help, we’ll do our best to point you in the right direct of someone who can. We look forward to hearing from you! See the main dog walking prices below or our prices page. Walks are an hour - this doesn't include pick up and drop off times. Send a message or call on 020 3743 9247 & we'll take some info to see who's best for you. Then we just do it! Book your regular visits. Make changes online. Pay monthly by bank transfer, card or direct debit. Easy. And if your regular walker's away? No problem or hassle. how to Your back up walker will be there instead. Want to meet some of the team? Send a message or call on 020 3743 9247 & we’ll take some info to see who’s best for you. And if your regular walker’s away? No problem or hassle. how to Your back up walker will be there instead. 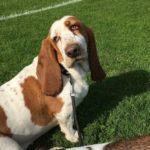 Happy Hounds and Cooler Cats dog walking service means you can feel safe in the knowledge your dog is getting the exercise and stimulation it needs, even if you’re unable to do it yourself.